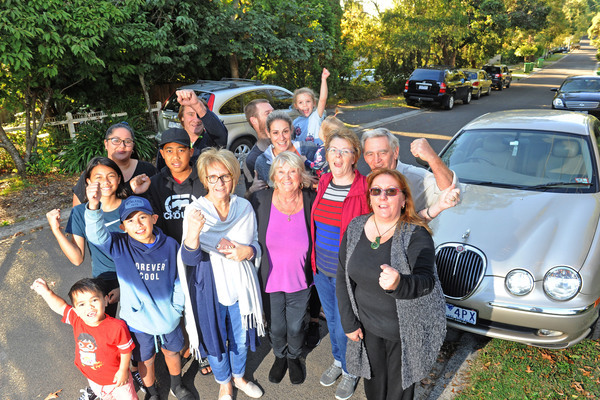 Mount Evelyn residents couldn’t contain their excitement and relief when Yarra Ranges Councillors heeded their call to knock back a proposed development in Glen View Road. The large group’s cheers floated down the hallway and back into the council chambers as they left the Tuesday 9 April meeting. The application proposed subdividing the 1486 square metre block at 17 Glen View Road into four lots and building two two-storey and two single-storey homes. It received 27 objections and one letter of support. The council report recommended approving the project. Julie Filer spoke at the meeting on behalf of the objectors. She lives across the road from the block in question and her family has called the street home since 1984, the street’s longest tenure. When they moved in, there were 18 houses on the street set on 18 properties. “This is bordering on high density, not medium density, and is not in keeping with the foothills nature of our township,” Ms Filer said. She questioned whether traffic assessors looked at the street during busy periods, describing residents and visitors regularly weaving in and out between parked cars. “Cars parked on the street create hazards for all,” she said. “Trucks have to reverse down the street backwards because they can’t turn around. Ms Filer said most houses in the street were single storey and weatherboard so the proposed brick two-storey dwellings were not in keeping with the neighbourhood character. She also expressed concern for the local powerful owl population due to tree removal proposed as part of the application, citing photographic evidence that the birds regularly roosted and fed in the street. “The loss of even one tree will have an impact on these owls,” Ms Filer said. She reminisced about the days when children could play in the street, and played audio from a young resident. “Can you please stop building houses on the street because it’s getting very dangerous for us to ride our bikes,” the child said. The packed gallery declared “enough is enough” in unison to conclude the objectors’ presentation. Michael Hales from consultancy firm Millar Merrigan spoke on behalf of the applicant. He said the property was in a medium density area and the proposal met all state and local planning policies. Mr Hales said it exceeded provisions for parking and open space and that landscape treatments were designed to meet bushfire overlay requirements. Cr Tim Heenan moved to refuse the application, with support from Cr Len Cox. “It’s getting enormously difficult to hold the line in this township,” he said. His motion was on the grounds that the application proposed excessive built form that would have unreasonable off-site impact; failed to respect the prevailing and preferred character of the area; would contribute to traffic issues; and failed to meet the preferred subdivision lot minimum size of 400 square metres. “I don’t want to see Mount Evelyn go the way of Ringwood and Croydon,” he said. Cr Len Cox said it was important to represent the community. “They elected us. Some of these developments, I don’t think are in the community’s best interest,” he said. Cr Jim Child opposed the motion. “I just cannot accept that this proposal fails to comply with multiple aspects of the Yarra Ranges planning scheme,” he said. He acknowledged concerns about traffic but said the report from traffic engineers said the issues could be managed. “This is a proposal which can be achieved in that precinct and I believe it should be supported,” Cr Child said. Cr Fiona McAllister said the council should drive change through changes to the planning scheme and lobbying the State Government, rather than refusing applications that predominantly complied with the planning scheme. She said population growth and increasing density were inevitable and affordable housing was an issue for the municipality. She voted against Cr Heenan’s motion alongside Cr Child. The motion passed.